With the evolution of NAND Flash technology, growth in SSD capacity continues. However, with this growth also arrive concerns about data quality due to existing issues related to error-correcting code (ECC), bad blocks, product failure, and disruptive effects associated with submicron technology. Solving these issues while leveraging existing hardware and software is of utmost importance. ADATA uses a proprietary A+Sorting algorithm to enhance the integrity and reliability of NAND Flash products. 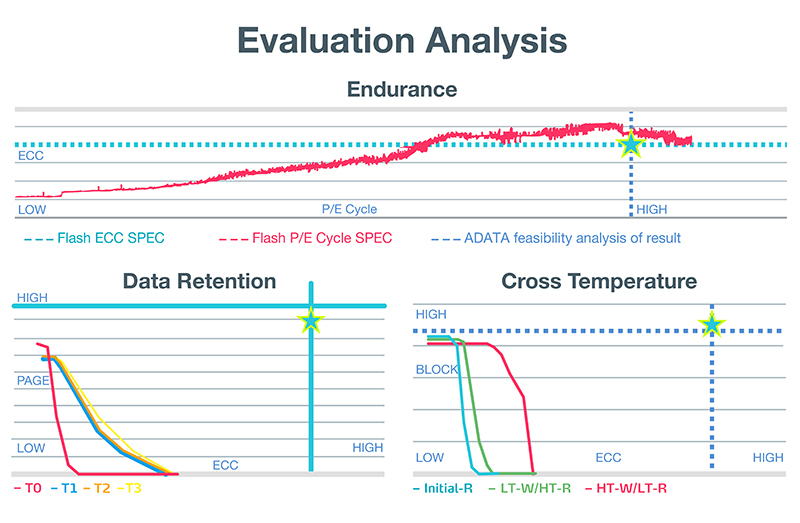 By making sure only the best quality chips are integrated into products, ADATA delivers SSDs that efficiently manage ECC and bad block issues, detect potential failures by analyzing NAND Flash characteristics at high and nominal temperatures, and generally boost integrity. Additionally, ADATA SSD quality is enhanced by optimal controller/Flash type matching. ADATA SSDs are tested and produced to meet the most demanding quality standards determined by leading ODM/OEM and IPC makers.